International Association for Social Work with Groups, Inc.
Group Work Camp offers opportunities for professionals, educators, and students to engage in experiential group work training, while at the same time “getting away from it all” in an informal and relaxed lakefront setting. Do you have a project that would benefit from IASWG endorsement and funding? Click here to learn more about SPARC! Thank you to the 2014 Symposium Planning Committee and volunteers in Calgary, Alberta, Canada for an enriching and memorable symposium. We need a variety of methods and approaches to teaching about the standards, both in dedicated group work courses and multi-methods courses. Alex Gitterman and Charles Garvin. Group News is an opportunity to share the most recent IASWG news about our advocacy and activities, including news in this issue about our exciting 2015 symposium in North Carolina. Following a wonderful symposia event last June in Calgary, the North Carolina Planning Committee members are busy planning a symposium event in North Carolina that promises to be a memorable experience on the historic and beautiful campus of the University of North Carolina at Chapel Hill. Our IASWG origins were in North America, where we continue to thrive (many of our U.S. IASWG Chapters have strong membership numbers currently, and our chapter activity in Canada will increase soon with a new chapter there.) In addition, we have successfully spread our group work advocacy and activity beyond North America (chapter members of our European Chapter, German Chapter, and South Africa Chapter welcomed with all of us our new Lithuania Chapter, and representatives from all of these IASWG Chapters met in Calgary, and phone conferenced recently, to discuss their exciting plans for chapter activities and ongoing growth.) Many IASWG Chapters are holding exciting events this fall season to support their region’s educators and practitioners. Visit our website and peruse this issue of Group News for evidence of the good work being done by our IASWG Chapters. The Executive Committee will phone conference soon, and the IASWG Board will have representation from our many IASWG Chapter and Committee members for the annual meeting in NYC in November to address IASWG priorities/goals for 2015. The Treasurer Report in this issue of the Group News nicely illustrates we are financially healthy, and we continue to discuss new ideas for increasing revenue through sound investment strategies and creative fundraising. Be sure to renew your 2014 membership, and encourage others to join IASWG! Communication with you will continue during 2015 through our various forms of IASWG contact: website, email, e-blast, phone, mail, Facebook, Twitter, and Group News. The IASWG focus will continue to be ensuring group work education, practice, education, field instruction, research, and publication survives and thrives in the global community. With its roots in the Settlement House movement, group work has proudly embraced the tradition of creating a space for all voices. Group workers today continue to advance this tradition. With a focus on mutual aid, empowerment, respect for diversity, equal participation, inclusion, and non-judgmental acceptance, group workers deter oppression by widening the circle to create a space for all voices. Co-sponsored by the University of North Carolina at Chapel Hill School of Social Work and North Carolina State University Department of Social Work. Information on Outstitues is available too! Symposium Reunion Celebration – Our annual reunion celebration for all IL Chapter 2014 symposium presenters will take place on Wed., October 8th from 5:30 p.m. to 6:45 p.m. at Loyola University Chicago. After a relaxing summer break and a new baby born to the Chapter chair, the Southern California IASWG Chapter is resuming it’s activities with a kick off event hosted by California State University, Long Beach. Every year the University hosts a back-to-school Associated Students of Social Work campus clubs event. IASWG will host a table, invite new membership, distribute chapter newsletters and advertise upcoming workshop events. October highlights will include the IASWG SoCal chapter Sunday Brunch Workshop, hosting Dr. Phillip Tan and his co-presenter Maria Gandarilla, MSW, and their presentation of “Talking Circles as a Method of Group Work”. Another point of interest: SoCal IASWG created it’s own local membership card, as a means to recognize local members and offer free CEUs to paid members during applicable workshops. SoCal is excited about another year of growth, education and membership with IASWG! The most recent NYC-Red Apple event was the Third Annual “Postposium” event on Sunday, September 21st in NYC. Chapter members had the opportunity to hear from Red Apple colleagues who presented at the 2014 Symposium and reconnected with other group worker over food, drink, and converstation. The theme of this gathering was the importance of community in social group work and within the organization. Learn more about Red Apple events on Facebook. We hope you will attend as many group work sessions as possible, particularly on Sunday when overall conference attendance drops. and the Group Work Track here. The Global Group Work Project is kicking off the New Year with the goal of developing further international connections among social group workers and building on the research, practice and education in social work with groups. With leadership by Carol S. Cohen, and now in partnership with Kyle McGee, we are working to expand IASWG in the global social work community. The Global Group Work Project website has been further developed and continues to attract viewers and subscribers from across the globe. You can access the site directly at: www.globalgroupworkproject.com or through the IASWG site from the Projects tab. The website is filled with information and resources about global group work and also serves as a platform for communication exchange among its international subscribers in relation to group work practice and research. Did you ever wonder how someone in the UK or Malaysia or Brazil might handle a particular practice issue in group work? Make sure to check out the “Questions about Group Work” area of the website or the “Regional Pages” to contribute to the ongoing conversations and exchanges taking place. To keep this international connection and momentum building, please make a point to visit the global group work project website (www.globalgroupworkproject.com) and become a subscriber. Our focus continues to be on providing a bridge to connect with our global group work partners and maximizing our ability to share information, network, and to learn about practice strategies from each other. The way to achieve this goal is through active participation among our members, so make sure to visit the website and subscribe today! Last year, the World Congress on Social Work and Social Action held in Stockholm, Sweden in July 2012 was a great success, and IASWG members were able to publicize, present workshops and hold a special interest group for members around the world who work with groups. The next biannual conference sponsored by the International Federation of Social Workers, International Association of School and Social Work and International Council on Social Welfare, will be held in Melbourne, Australia from July 9-12, 2014. Info at: http://www.swsd2014.org/ . It still seems quite far away, but Carol has been appointed to the Conference Planning Committee by the CSWE Global Commission, and welcomes your thoughts on how group work content can be highlighted and expanded. As social workers, educators and social development practitioners, we witness the daily realities of personal, social and community challenges. We believe that now is our time to work together, at all levels, for change, for social justice, and for the universal implementation of human rights, building on the wealth of social initiatives and social movements. 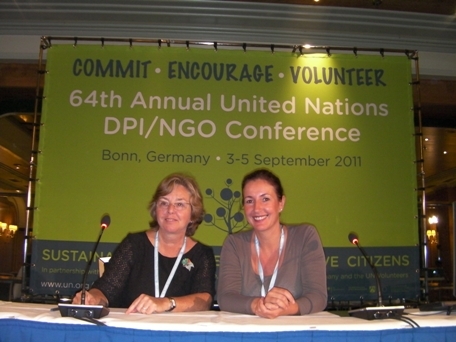 We, the International Federation of Social Workers (IFSW), the International Association of Schools of Social Work (IASSW), and the International Council on Social Welfare (ICSW), recognise that the past and present political economic, cultural and social orders, shaped in specific contexts, have unequal consequences for global, national and local communities and have negative impacts on people. IASWG continues to expand its international networking and influence in practice, research and education in social work with groups. This past summer, IASWG had a strong presence at the Joint World Conference on Social Work and Social Development: Action and Impact, held in Stockholm, Sweden from July 8-9, 2012. The Conference was co-sponsored by the International Federation of Social Workers (IFSW), International Association of Schools of Social Work (IASSW) and International Council on Social Welfare (ICSW). Over a thousand social work related professionals joined together for three days of networking, papers, workshops and other events. Steve Kraft was a great group work ambassador at our busy booth in the Exhibit Hall, which we shared with Whiting and Birch (publishers of Groupwork and our IASWG Symposium proceedings). As part of the conference program, Carol Cohen (Co-Chair of the IASWG Commission on Group Work Education) and Tim Kelly (Co-Editor of Groupwork) convened a Special Interest Group for people who work with groups around the world. Our purpose was to provide an opportunity to talk about the challenges, joys and demands we encounter – and make connections for the future around our common concerns and interests. Among the 25 participants were people from Austria, Belgium, Canada, Finland, Hong Kong, India, Israel, Japan, Malaysia, Nepal, Norway, Spain, United Kingdom, United States, and West Indies. As noted in the abstract describing the Special Interest Group Session: Experiences with groups for action and impact around the world suggest that members and their communities desire the opportunities promised by group participation. Group membership appears central to human experience and the promotion of social justice. However, while the power of groups is indisputable, people who work with diverse groups rarely have the opportunity to talk with each other about the connections, challenges, joys and demands they encounter. Our very lively and productive session began with greetings and sharing our interests. We then discussed the diverse group work challenges in each of our countries and communities. From there we talked about successes in group work practice and teaching. There was a great deal of interest in building on the enthusiasm and ideas for future collaboration. We discussed and broadened connections in current and future research related to self-help groups, cross-national studies of group work practice, and international collaborations in field and classroom education in social work with groups. IASWG had an important presence at the session, with Steve Kraft (IASWG President) and Mark Smith (Board Member) attending, as well as Michael Preston-Shoot (Plenary speaker at the Montreal Symposium), and Andres Arias Astray (Translator of the IASWG Standards into Spanish). The full list of participants and session summary will be posted on the Global Group Work Project Website (www.globalgroupworkproject.com) and the IASWG website. In the final stages of the session, we reviewed the Stockholm program, and agreed that while there were sessions related to group work, many sessions with a group focus or containing implications for group work practice and education were not specifically identified or grouped together. 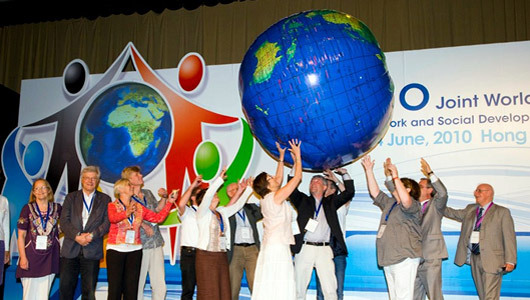 In planning for the next World Conference (July 9-12, 2014 in Melbourne, Australia), we resolved to expand the presence of social work and social development with groups, and will work on three strategies. First, we will encourage our colleagues to submit group work focused abstracts, which explicitly identify group work as a key theme. Our second recommendation is to propose a series of group work related Symposium sessions (programs that include multiple papers or presenters) to the 2014 organizers early in the planning process, which we would develop around themes such as group work education, practice and research. We committed to planning presentation formats that were both informal and formal, including those that fostered participant discussion in groups. This initiative has already begun with conversations with leaders of the Melbourne planning committee, and will be supported by the recent appointment of Carol Cohen to the International World Conference Planning Committee, representing the Global Commission of the Council on Social Work Education. Lastly, our third recommendation for the next World Conference is to propose another Special Interest Group session, to expand opportunities for us to meet, share and move forward. The progress of these activities and expanded connections will be disseminated through the web and in future issues of the IASWG Group News. In order to build on this momentum, please share your recollections of the Stockholm conference, feedback on our plans, specific ideas to consider, and your thoughts on moving forward with all aspects of international social work with groups. There is much to report on social work with groups and the AASWG internationally! Since we are still in the process of applying for AASWG’s affiliation with the UN’s Department of Public Information, Adelphi University sponsored our Special Interest Group and status as conference delegates. By attending the conference, Sonia and I could see multiple benefits of continuing in the application process – and important work we could do with the affiliation with the United Nations and through collaboration with other Non-Governmental Organizations. We will continue to share information about this process and hopefully, news of our affiliation status before too long. The news about the Global Group Work Project Website at: https://globalgroupworkproject.wordpress.com/ is that we are moving to the next level, with Regional Pages from Scotland and Brooklyn. Also in development are pages from Namibia and India. We invite AASWG Chapters and members to propose a Regional Page about group work in their own community. We are happy to provide all the information and back-up needed. Outside Dhaka, Bangladesh, a member speaking for her group said, This group is a very good community. In Mumbai, India, a member shared, This group is our family. These are only two ways that members describe their groups. The Global Group Work Project (www.globalgroupworkproject.wordpress.com) will launch new regional pages. These pages will be coordinated locally, and will share narratives of groupwork, training and education reports, and practice strategies and experiences. JOIN US! We are developing a roster of international pages now, and collecting content for uploading. If you or your AASWG Chapter, or other group would like to coordinate a page please contact Carol S. Cohen soon (cohen5@adelphi.edu). We are using WordPress software, which makes page construction quite easy. We also welcome any other input about the site, and look forward to hearing from you. Lastly, I hope to have whetted your appetite for news of internationally focused AASWG activities, and invite you to let us know what you are doing and what interests you. There is much going on and we will be updating our website page at www.aaswg.org soon. We see this as an excellent place for community discussion, sharing resources, and networking. In the interim, please email –Your input is very welcome! Useful info. Fortunate me I discovered your site unintentionally, and I’m stunned why this accident did not took place earlier! I bookmarked it. Dear Subscriber; Great to hear that this information is so useful! Please continue to give us your feedback as well as any ideas that would contribute to our building global conversation about group work.